On a blazing morning in May 2012, top government representatives of two Central Asian states (CAS), Afghanistan and Pakistan, stream into a plush conference room at the Grand Hyatt in Dubai to discuss an ambitious energy project. There is a heavy contingent of World Bank officials on hand to steer the ministerial talks on the $1 billion project that will bring electricity from the energy-rich countries of Kyrgyzstan and Turkmenistan to South Asia. The CASA 1000 project, as it is called, is expected to be the harbinger of improved energy security in South Asia, which is essentially an area of darkness. CASA 1000, which the World Bank is part-funding with a loan of $510 million, is projected to bring in 1,300 mega Watt (MW) of electricity into Afghanistan from its neighbours who are floating in petroleum and have enough power to spare. War-torn Afghanistan requires just 300 MW currently and the rest is to be transmitted to Pakistan. The project is part of a grand idea of integrating the energy infrastructure of the region which was thrown up by a summit of South Asian Association for Regional Cooperation, or SAARC, leaders in 2004 in Islamabad. The idea is to have energy rings in places where trading of power is possible (see ‘Power exchange’). At the Dubai meeting there is general agreement on this path-breaking venture among the assembled officials. But the more interesting development for the rest of South Asia, particularly India and Pakistan, is the interest in another initiative: a power link between the two neighbours who are also the largest countries in the eight-member SAARC. On the sidelines of the CASA meeting, the World Bank holds an unscheduled session to discuss power trade between Pakistan and India. It is here that the project for exchange of 500 MW of power from India to Pakistan is initiated, with then Pakistan minister for water and power Naveed Qamar readily agreeing to a pre-feasibility study. Later, the minister pulls out all stops to get the report finalised in double quick time. But, despite being fast tracked and the World Bank putting its full powers of persuasion behind it, the electricity link between Amritsar in Indian Punjab and Lahore in Pakistan’s Punjab has still a long way to go. High-level delegations of the two countries have met to discuss the power trade but there is no tangible outcome as yet. The deliberations have been kept confidential; there is nothing on paper. What has been achieved so far is a pre-feasibility report by consultants appointed by the World Bank for the project which will cost no more than $120 million. In Islamabad there are complaints about the “not very cooperative attitude of the Indian bureaucracy” which refused to share details of power availability and the way the electricity markets work in India. For its part, Indian officialdom justifies its position by saying it could not have done otherwise because there is no formal agreement on inter-connectivity. Experts say that barring the political nod everything is in place for the grids to be connected. The broad regulatory frameworks and associated laws in both India and Pakistan are similar and pose no legal hurdle to power trade, they say. Neither do the technical aspects. According to them, all that is needed is a 30-40 km high voltage direct current (HVDC) transmission line. Although India works on a 400-kilovolt (kv) line while Pakistan uses 500 kv, a back-to-back alternate system should work, they say. For India, the cost is minimal, at around $10-15 million, according to persons privy to the report. The rest of the cost will be borne by Pakistan which has reportedly called for a final feasibility report. Qamar, who was stripped of his portfolio in June 2012 ostensibly because of the acute power crisis in Pakistan that had resulted in heavy load-shedding in its Punjab province and shifted to the defence ministry in the Yousuf Raza Gilani government, told Down To Earth (DTE), “There are too many political issues to be resolved between the two countries but Pakistan is moving forward on these. India has to understand this change.” This is a common refrain in Pakistan where officials, political analysts and journalists accuse New Delhi of failing to respond to the new political winds blowing across the country. They believe that India’s intransigence and insistence on resolving issues bilaterally is the main impediment to a cohesive South Asia. Qamar and others of his ilk could be a mite too sanguine about Pakistan’s desire to move forward on cooperation. There is invariably some political opposition to any rapprochement. In September this year, the Senate Standing Committee on Water and Power opposed the move to import electricity from India and said the government should not be wasting huge amounts of money undertaking feasibility studies and raising loans from multilateral agencies. In a report from Islamabad, Dawn quoted Senator Zahid Khan of Awami National Party, chairperson of the standing committee, as saying, “How is it possible to import electricity from India amid exchange of heavy firing on the borders for 20 days in a month?” The money, he said, would be better utilised in expediting hydropower projects. This is but a small example of how complex such issues, even a mutually beneficial power exchange, can become in South Asia. It is a region like no other. Historical rivalries have left a bitter legacy of deeply entrenched antagonisms and a huge trust deficit. India is viewed with suspicion by its neighbours. Or, as an arrogant and sometimes meddlesome Big brother of South Asia. The exceptions have been Bhutan and till recently Maldives with which it has enjoyed a sound relationship. In fact, the tragedy of SAARC has been that the Bhutan example has not proliferated. Since 1974, the Himalayan Kingdom has been supplying hydropower to India, the total now coming to around 1,000 MW. The consequences of mutual distrust are immense for the 1.62 billion people who live here, people who account for the largest number of the poorest outside of sub-Saharan Africa. In terms of energy security, too, they are among the most vulnerable. Hundreds of millions have no access to electricity, whereas their giant neighbour China provides power to practically its entire population (99.7 per cent). Viewed as the regional superpower, India is usually blamed for having stalled cooperative energy ventures. Charles Ebinger, author of Energy and Security in South Asia: Cooperation or Conflict? sums up the mess and political impediments with the example of Nepal. He says hydropower is “one of the great tragedies of the region” because its tremendous resources lie unexploited. Nepal’s total installed capacity is just 757 MW, the size of one coal plant in India, it is sitting on a potential of at least 43,000 MW of commercially viable hydropower. It is this fact that upsets Ebinger. At the launch of his authoritative book on South Asia, Ebinger, director of the Energy Security Initiative and a senior fellow at Brookings Institution, had this to say: “I literally spent 10 years representing the government of Nepal on funding by various donor agencies. It is easy to see India as the villain of the piece in all such failures. But other countries, too, have been equally mistrustful. In the case of the Iran-Pakistan-India gas pipeline, which has been in the works for close to a quarter century, international analysts say Islamabad did play politics with the first pipeline project in South Asia (see ‘Still in the pipeline’). India’s misgivings on the security of the project and finally the sanctions pressure exerted by the US have made it opt out of the multi-billion dollar project. The big game that is played over the world’s energy resources makes no concession for pusillanimity and that is why there are thousands of kilometres of pipelines stretching from Russia, Central Asia going all the way to China but none coming to this part of the world. There was a time, during Mani Shankar Aiyar’s tenure as minister for petroleum and natural gas (2004-06), when India was in the forefront of seeking energy cooperation not just with its SAARC partners but China, Russia and West Asia, too. In January 2006, he famously said, “The Asian Resurgence depends on energy cooperation in Asia. The 21st century will indeed be the Asian century only if Asian countries join hands in a continent-wide bid at bringing Asia together and keeping Asia together.” He was sacked by Manmohan Singh within days of that speech. In a detailed conversation with DTE, Aiyar explains how and why cooperation between India, Bangladesh and Myanmar on a gas pipeline, a deal that he had in the bag, was torpedoed by the Ministry of External Affairs for geopolitical and security reasons (see www.downtoearth.org.in for detailed interview). His belief is that the future of South Asia lies in the region coming together, in enmeshing the economies together, primarily through energy linkages. “In our quest for energy security, we seem to be paralysed in our search for friends and partners, or to have abandoned the effort in despair,” says Aiyar. Pakistan is possibly in the worst fix amongst all SAARC countries on energy. Shortfall in electricity supply currently averages at 25 per cent of demand or 4,000 MW, increasing to 6,000 MW in peak season. Peak power load shedding extends to 20 hours in rural areas and to eight in urban areas. In winters, the outlook is chilly because the shortfall in natural gas supply is as much as 50 per cent of the demand. One of the reasons for the five-day week in Pakistan is to conserve dwindling fuel supplies. Efficient combined cycle power generation capacity remains idle due to shortfall in gas supply and less efficient fuel oil-fired steam units are being operated to meet the demand which increases the cost of electricity generated. This is a sad state for a country that was among the first to embark on a major utilisation of gas after the discovery of the giant Sui field in the 1950s with even its vehicles running on compressed natural gas (CNG). Its automobile fleet is probably the largest user of CNG anywhere in the world. Consumer electricity prices, however, have doubled in the last three years, and are currently among the highest in South Asia, with tariffs ranging between 7 cents and 12 cents per unit. Yet, Pakistan’s circular debt problems are a besetting worry. This is the result of its Central Power Purchasing Agency having no money to pay the power supply companies because of non-payment by the provincial and federal governments. On December 9, the Asian Development Bank (ADB) stepped in with a loan of $900 million for a new supercritical coal power generation that is being planned as an emergency measure. Announcing the loan for the 600 MW plant, Klaus Gerhaeusser, director-general of ADB’s central and west Asia department, spoke of “acute power shortages of up to 20 hours a day that have crippled economic growth and are contributing to unemployment and social unrest across the country”. Perhaps that is one reason Pakistan is willing to talk to India on buying imported liquified natural gas (LNG) from the state-owned Gas Authority of India Ltd (GAIL). Sources in the petroleum ministry in New Delhi say India is ready to export 400 million cubic feet of gas daily to Pakistan if the price is right. This would involve the laying of a 110-km pipeline between Jalandhar and Attari. Although negotiations lost momentum after fresh outbreak of hostilities on the Line of Control, in September talks resumed during the visit to Delhi of Sartaj Aziz, adviser on foreign policy to Prime Minister Mian Nawaz Sharif. The Indian side is reportedly seeking payment guarantees before it inks a gas supply contract. While such guarantees form part of any commercial deal, the sticking point is the $21 per million British thermal units (mBtu) that GAIL wants. Imported LNG, costing around $14 mBtu will be regassified before it is piped to Pakistan. If the project does see the light of day it would provide a much stronger thrust to regional energy cooperation than the power exchange that is taking place between India and Bangladesh. For Pakistan, which expects to have its first LNG terminal ready by the end of 2014, there is every reason to push the project if a deal can be struck on prices. Official source in Islamabad told DTE, “No government will survive if it buys from India at this price.” The energy crisis has led to a sharp drop in investment and left industry and small businesses in bad shape. In 2012, the shortfall lopped an estimated two percentage points off the country’s GDP, while the rising tab for imported fuel oil continues to strain its finances. India’s power situation is not all that comfortable either, with an energy deficit of 8 per cent and peak demand shortfall of over 9 per cent. In July 2012 it suffered a massive grid collapse, leaving most of north India in utter darkness for several hours, twice in the course of a week. That is one reason some Indian officials scoff at the idea of energy cooperation because they say there simply isn’t enough power to go around. Mismanagement of the resources, and the high levels of energy subsidy in each of these countries coupled with spiralling demand have meant that governments are forced to take decisions that do not bode well for their economies or their environment. Take the case of Bangladesh. In October this year, Bangladesh celebrated a milestone: the power generation capacity crossed 10,000 MW. There was reason to celebrate because for years on end there were 10-hour power cuts countrywide. Now per capita consumption is up 75 per cent to 321 kWh. But these increases have come at a cost. Much of the capacity addition has been through expensive oil-fuelled plants where per unit cost of generation is 15 times that of gas stations or four times that of coal-fired plants. Although the bulk (65 per cent) of the electricity is now generated from natural gas, coal will be the fuel of the future. Such plants are expected to produce half the electricity by 2030 while gas will account for just 23 per cent due to depleting reserves. Interestingly, it is banking on the regional grid to provide nine per cent while nuclear is envisaged to contribute 10 per cent. The share of oil-fuelled power plants will be cut to five per cent. significant portion of the GDP. 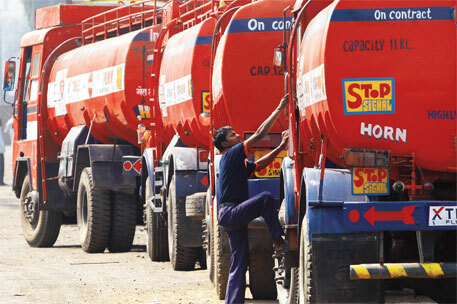 In 2012 alone Bangladesh spent 4.1 per cent of its GDP to pay for oil imports. For a country which still runs its energy-intensive sectors on supply of cheap domestic gas, the advent of oil-fired power plants has been a costly choice. “The government aggressively promoted oil-based power generation as an emergency measure which is costly and inefficient. It also brought in private players to start these plants guaranteeing them huge profits,” says Anu Muhammad, professor of economics at the Jahangirnagar University, Dhaka, and secretary of the National Committee to Protect Oil Gas Mineral Resources Power and Ports, a civil society group working on energy issues. All of South Asia is vulnerable on the count as there is increasing dependence on imported energy, specially petroleum. India imports 80 per cent of the crude oil it requires, while Pakistan imports over 84 per cent and Bangladesh over 95 per cent; the other South Asian economies rely totally on imported oil. An equally important statistic is that nearly a fourth of the energy input that goes into economies of these countries comes from traditional biomass. 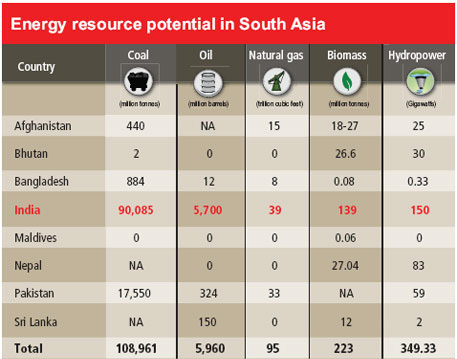 The per capita energy use in the SAARC region is only 514 kg of oil equivalent per capita per year, a pathetic figure compared to other regions. What is the outlook? Energy experts say SAARC’s primary energy demand could increase by 50 per cent by 2030 while its power demand could triple by 2030. Despite the apparent deficit, Ebinger believes the way forward is cooperation. He says South Asia is sitting on huge domestic resources, such as coal and natural gas even if it is “not as great in the existing fields as we had thought.” Cooperation, he insist, is the only way. India, according to the International Energy Agency, has 63 trillion cubic feet of shale gas, apart from the possibility of large reserves of conventional gas that is yet to be explored. Pakistan, too, has substantial deposits, but in the tribal areas of Balochistan where violent insurgency is under way. But ultimately, energy cannot be divorced from overall trade. SAARC is economically the least integrated of trade blocs. Bilateral trade between India and Pakistan is insignificant at $ 3 billion, which is just a fraction of their overall trade with the rest of the world. Before the romance of energy cooperation, the region needs the bedrock of larger commercial exchanges. Nothing exemplifies the geopolitics of energy and its impact on developing countries better than the Iran-Pakistan-India (IPI) pipeline. The project, often referred to as the ‘peace pipeline’, has over the course of its long and winding history become a two-letter acronym, IP, after India pulled out of the project in 2009 under US pressure. Delhi was forced to distance itself from Teheran in the wake of its nuclear deal with Washington, a policy that has had serious costs: estranged relations with an old ally and the possibility of ensuring, at least partly, its energy security. Pakistan, desperate for gas which is its energy lifeline, has gone ahead with the pipeline in defiance of US warnings. The pipeline was originally envisaged to be 2,670-km long, with the longest stretch of 1,115 km lying inside Iran and another 700 km in Pakistan. It would have brought both India and Pakistan around 1 billion cubic feet daily of gas from the enormous South Pars field. The IP pipeline was first proposed by Iranian and Indian officials in Teheran and Delhi in 1989. There is a chequered history to the pipeline with both Pakistan and India blowing hot and hot over the project in response to regional politics and superpower pressures. While traditional rivalry and mistrust between the Asian neighbours was initially responsible for holding up the project, the Iraqi invasion of Kuwait in 1990 upset India’s traditional oil supply lines and prompted it to sign a memorandum of understanding with Iran on energy cooperation despite unresolved concerns on the security of the pipeline which passes through insurgence-racked Balochistan. Two years later, in 1995, Pakistan, too, signed an agreement with Iran on the pipeline. Since then, a large section of the IP pipeline has been completed. Iran has completed its section of the pipeline and is helping Pakistan with its stretch (see picture). There was jubilation in Islamabad when Iran and western powers reached a pact in Geneva late in November on the question of Iran’s nuclear programme. However, Washington has made it clear that sanctions remain in place on the pipeline. The clarification was made after Iran and Pakistan decided to set a time frame for implementing the pipeline project during a visit to Teheran by Sartaj Aziz, Pakistan Prime Minister's Advisor on National Security. Under the terms of the bilateral agreement, Pakistan has to complete the pipeline by December 2014, but this is in doubt since funding has dried up. Iran has expressed its inability to provide the promised $500 million of the total cost of $1.8 billion for constructing the pipeline while the threat of US sanctions has kept lenders away. The major snag, however, is the price of gas. Initially, the three parties had agreed upon a price of $4.93 per million British thermal units (mBtu), a price benchmarked to crude oil prices. This will prove hugely uneconomic, a just-released report by the reputed think tank Sustainable Development Policy Institute (SDPI) warns. It points out that the increase in gas supplies in the US has led to a decoupling of gas prices from crude oil rates and suggests that the Pakistan government rethink its energy policy options. Arshad H Abbasi, author of the study, told Down To Earth (DTE): “Our study questions the price of gas agreed upon in the agreement with Iran.” The gas is intended for generating electricity and Abbasi’s calculations show that far from being the panacea for Pakistan’s energy problem as it is promoted, IP gas pipeline project would, under current pricing formula, push up generation costs by as much as $4.2 billion instead of helping to save $2.4 billion by replacing costly furnace oil. At the moment India is not interested in the IP project. A senior official of the Ministry of Petroleum says its focus is on another project, the Turkmenistan-Afghan-Pakistan-India pipeline. The price of that gas, says the SDPI report, will be as costly since they are linked to crude prices. Will energy cooperation between India and Pakistan take off or will politics always cloud any possibility? The near term outlook is not conducive or encouraging with the prevailing conflicts between India and Pakistan and in Afghanistan, associated with withdrawal of US troops. The push for energy trade between India and Pakistan is mainly supported by the international finance institutions, primarily World Bank, with limited active interest and support from the governments. The possible game changer on the horizon is regional strategic adjustment post US withdrawal from Afghanistan. The other possibility is containment of terrorism by Pakistan followed by economic growth and security which will support the development of regional markets and trade. How do you see the South Asia grid shaping up? Will it benefit Pakistan? The foundations for grid are already there, with trade taking place between other South Asian countries. Much of the technical and commercial groundwork for Pakistan-India trade has already been done, and connections can be built at a fairly low cost given the proximity of the transmission systems, generation capacities, and demand centres across the border. Pakistan can benefit tremendously by trade both in terms of reduction in peak shortfalls and cost of electricity. How hopeful are you of the Iran-Pakistan pipeline taking off especially after Iran expressed its inability to provide funds for its construction? Starting in mid-nineties when BHP was developing the project, the price of gas offered by Iran has risen from just about 1.0 $/mBtu to over $15/mBtu. The global gas and LNG market has also changed dramatically since, with entry of shale gas and improvements in LNG technology. The US sanctions are in effect, and Pakistan is grappling with a deteriorating security situation in Balochistan. Iran will also have to invest in development of gas fields for a secure long-term supply, and both Iran and Pakistan are struggling to arrange financing for the energy sector. Pakistan may divert the scarce capital to LNG and power generation, as opposed to blocking it in a pipeline. All these considerations do not support an early realisation of the IP gas pipeline project. If the project sees the light of day do you see any prospects of India joining it? For reasons stated earlier, combined with a longer distance of pipeline to India, transit fees through Pakistan, and already established LNG terminals in India, the prospects of India joining in do not look bright. Pakistan may offer a better price to Iran if at all the project matures. A capacity increase and extension of pipeline to India would be a possibility if Pakistan starts purchasing and the operation is demonstrated as secure through Pakistan. Pakistan appears to be banking on cooperation with Central Asia to meet its future energy requirements. Currently, the projects under active consideration are the CASA 1000 project for import of about 1,300 MW of electricity (corresponding to about 6 per cent of the demand in Pakistan) from Kyrgyzstan and Turkmenistan, and the TAPI project for import of 3 bscfd gas from Turkmenistan. Of this, Pakistan has expressed intentions to lift 1 bscfd (corresponding to about 20 per cent of country demand), while 2 bscfd will flow to India. These projects are also more complicated with multiple countries and multiple governments involved and associated risk and liability management. In such a scenario how important is South Asian energy cooperation for Pakistan? This would be the simplest and most economic alternative taking into account the investment, technology, security, and market fundamentals. The bilateral and regional security and stability gains would be enormous. Is the TAPI project viable? The security risks and commercial complexity make the project difficult to realise, but the potential benefits are so great that it would be worthwhile for India and Pakistan to do whatever they can to make this project happen. Cooperation between South Asian countries may solve energy crisis. But is it possible? It’s like the buzz of a million bees. The reverberation is caused by the sheer volume of power flowing into the 400 kilovolt (kv) high-voltage power transmission line at Bheramara, a small town in Kushtia district of Bangladesh. 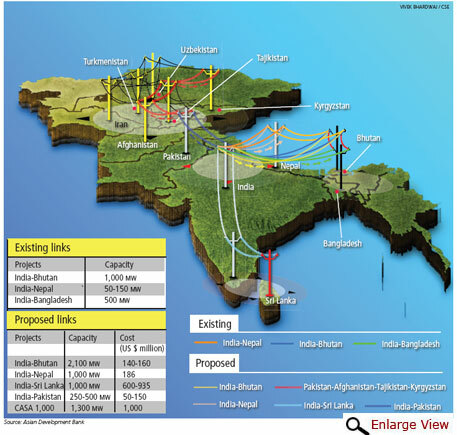 The transmission line and substation, which became operational on October 5 this year, are South Asia’s latest inter-nation power grid through which India supplies 500 mega Watt (MW) of electricity to Bangladesh every day. This is substantial for a country whose largest power plant has a capacity of just 450 MW. The substation is a highpoint in the career of Kazi Istiaq Hasan, project director of Power Grid Company of Bangladesh. Spread over 45.7 hectares, it has 98 km of transmission lines running between the two countries through 197 towers. “From planning, designing to execution, it took a record time of three years. It happened due to the involvement of both countries’ prime minister’s offices,” he says. This is the first bilateral thermal power exchange in the South Asian energy ring mooted during the 12th SAARC summit in Islamabad in 2004 (see ‘South Asia power network’). The super grid is still a concept but the Bheramera substation is a move towards its creation. India already has two such interconnections, with Bhutan and Nepal. These are hydropower-based. The eight SAARC nations believe energy cooperation can solve the region’s power crisis. At a recent conference organised by the Independent Power Producers Association of India (IPPAI) in New Delhi, envoys of six SAARC countries, including Afghanistan, hailed the energy ring. Bangladesh’s high commissioner Tariq A Karim said his country could use surplus power from the proposed 69,000-MW generation in Arunachal Pradesh. His Pakistani counterpart Salman Bashir wanted power cooperation to move beyond politics and have the grid extended to his country. 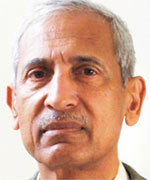 Sri Lanka’s Prasad Kariawasam stressed on exploring the possibility of exporting wind energy to India. The SAARC Power Exchange Report, published last year by the Islamabad-based SAARC Energy Centre, states that South Asia characteristically has surplus power resources and electricity deficit areas. The Himalaya-fed water resources of Bhutan and Nepal, for instance, have immense untapped hydropower potential. Bhutan generates only five per cent of its estimated 40,000 MW hydropower potential. For Nepal, the generation is merely 1.7 per cent of its capacity of 43,000 MW. Sri Lanka has tapped very little of its 10,000 MW wind power. Bangladesh and Maldives are almost entirely dependent on fossil fuel. 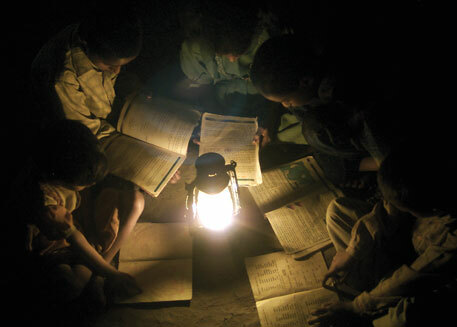 In Afghanistan, one in every three persons has access to electricity. India and Pakistan, the two larger economies, depend on a mix of hydro and thermal capacities. Their dependence on imported fossil fuel is rising steadily. “An interconnected power system will help overcome the mismatch between energy demand and energy resource endowments in the region and enhance energy security,” says Hilal Raza, director of SAARC Energy Centre. This will reduce reliance on expensive import of oil, gas and coal. “Domestic energy developments and bilateral energy exchange agreements alone cannot solve power crisis in South Asia. The engagement has to be multilateral,” says Raza. An improved power situation will boost economic activity in the region. The idea of multilateral energy cooperation in South Asia is about a decade old, but bilateral energy exchange agreements date back to 1950s when India and Nepal decided to build hydropower projects on the Kosi and Gandak rivers. India built a 20 MW powerhouse for Nepal at Kataiya on the Kosi. It was mainly for irrigation and flood control. Power generation was the byproduct. Later, the two countries established exclusive projects for electricity transmission. India now exports 150 MW to Nepal in winters and 70 MW in summers. Nepal pays an average of Rs 4.8 per unit of power to India. Bhutan, too, has a history of energy cooperation with India dating back to 1974 (see ‘Bhutan’s experiments with happiness, Down To Earth, October 31). Bhutan’s present installed hydropower capacity is 1,488 MW, 80 per cent which is supplied to India. In winters, when river flows dwindle, Bhutan imports 40 MW from India. Although small, the pact has helped Bhutan’s economy. It earned the country US $233 million in 2010-11 from sale of power to India. “Power export has helped Bhutan increase its GDP by 8.6 per cent from 2008 to 2012,” says Chhewang Rinzin, managing director of government-owned Druk Green Power Corporation. “However, interconnected power systems of India, Bhutan and Nepal have elicited only a small part of potential benefits,” states a study by South Asia Regional Integration, a joint project of United States Agency for International Development and Integrated Research and Action for Development (IRADe) last year. India, Bhutan and Nepal have decided to enhance this cooperation. In 2006, Bhutan and India signed an agreement to develop hydropower projects totalling a capacity of 10,000 MW by 2020. Construction work has already begun on three projects with a total capacity of 2,900 MW, which are likely to be commissioned by 2016. Since Bhutan’s peak load is expected to remain below 500 MW by then, most of the power would be exported to India. In comparison to Bhutan, Indo-Nepal energy trade relations have seen slow progress. “Despite a long history, our bilateral energy cooperation has not grown on expected lines,” says Rajan Dhakal, deputy general manager with Nepal Electricity Authority. “Governments, private companies and banks are reluctant to invest in Nepal due to lack of a stable government,” he adds. As a result, the demand-supply gap in Nepal is 44 per cent, the highest in South Asia. Parts of Kathmandu currently experience 15-hour power cuts. With no new hydropower projects expected soon, Nepal will look for power from India. 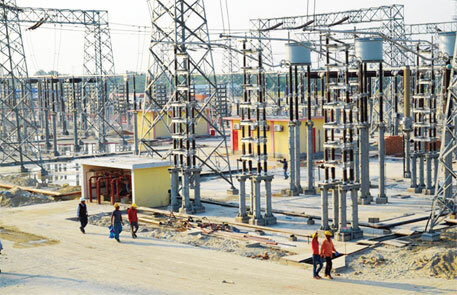 A 126-km transmission line between Muzaffarpur in Bihar and Dhalkebar in Nepal is expected to be complete by December 2014. This can carry 1,000 MW of power and cost $186 million. More such projects are being planned. Moving southwards, an ambitious 360-km link between India and Sri Lanka is being proposed. Of this, 120 km will lie on the sea bed. The link will connect Madurai in Tamil Nadu with New Anuradhapura in Sri Lanka and transmit 1,000 MW. The two-way exchange will see India give peaking support to Sri Lanka. The country, in turn, will sell its surplus off-peak power of around 800 MW to India. But laying high tension cables on the seabed is expensive. At $935 million project cost, both the countries are unsure of profit. “The project will make sense if the gains from the exchange are more than the investment,” says P N Fernando, Colombo-based adviser to Asian Development Bank (ADB). “Initially, the undersea cable was to be about 15 km, from Dhanushkodi in Tamil Nadu to Talaimannar in Sri Lanka,” says Durga Raina, adviser to ADB, which is studying South Asia energy cooperation. “But a longer route was chosen because the region is ecologically fragile, and there was a fear of opposition from religious groups because the line would cross Ram Setu,” says Raina. Tilak Siyambalapitiya, energy expert in Sri Lanka, says even if the project is undertaken there will be little business. Southern India is already reeling from power crisis, he told mediapersons. Maldives does not have a power exchange plan with any South Asian country as its geographical location would make transmission expensive. There is a US $1 billion plan to wheel electricity from Tajikistan and Kyrgyzstan in Central Asia to Afghanistan and Pakistan. It will traverse a treacherous route through the Hindukush. In summers, Tajikistan and Kyrgyzstan have 6,000 gigawatt hours surplus hydropower, while Pakistan and Afghanistan reel from power crisis. If the project, called CASA 1000, becomes operational, 1,300 MW of electricity could flow through it. Pakistan will get 1,000 MW and Afghanistan will take the rest. Devendra Chaudhry, additional secretary, Ministry of Power in India, said at a recent conference in Delhi, “Electricity is like goods. One can trade them when they are in surplus. But India will never have surplus power. Also, one has to see if the other side has the money to pay.” An ADB consultant, who does not wish to be named, says, power-strapped countries such as Bangladesh would be ready to import power because they spend a lot on power generation through imported oil. Investors are reluctant to invest in cross-border interconnections. “What if two governments turn hostile or refuse to buy power due to domestic crises such as drought?” asks Anoop Singh, Department of Industrial and Management Engineering, IIT-Kanpur, who has worked with USAID on South Asia energy cooperation. “India’s energy connection with Nepal has been slow. Two years ago, we sent a draft of power trade agreement to India. It has not been signed yet,” says Bishwa Prasad Pandit, secretary, Ministry of Energy, Nepal. A key component needed for easy trade of power is an exchange, which will facilitate transfers between the energy haves and the have-nots. SAARC Energy Centre has proposed South Asian Power Exchange modelled on two existing exchanges in India. India Energy Exchange (IEX) and Power Exchange India Limited are about five years old. The quantum of electricity traded through these is only 3 per cent of India’s total power trade. But in a short time, they have gained the reputation of being efficient and transparent. To trade through IEX, generators and buyers should be its members. For transaction, the seller and the buyer quote prices and volume of power to be traded a day ahead. Once the prices are quoted, the exchange calculates a market clearing price and volume. It is a mutually agreed price between the buyer and the seller. But these exchanges cannot yet become the fulcrum for South Asia, says Shilpy Dewan of IEX. “South Asian power exchange could be an expanded form of IEX,” she adds. But the Indian guidelines currently permit domestic companies to participate in the exchange. For other countries to participate, these guidelines will have to be amended. Besides, other than Bhutan and Nepal, no South Asian country legally recognises power as a tradable commodity. Individual bilateral agreements dictate the rules governing these transactions. “While issues of taxation and import duties will have to be addressed, a mechanism for bilateral dispute resolution will also be needed,” says Jyoti Parikh, founder director of IRADe. SAARC Energy Centre has prepared a draft called SAARC Inter-Governmental Framework Agreement for Energy Cooperation (Electricity). It intends to create SAARC Market for Electricity, which will provide for unrestricted cross-border trade, commercial negotiation of power purchase agreements, private sector trading and participation in power exchanges. “It is being considered by SAARC members,” says Raza. This will be an expensive proposition. A study by SAARC Energy Centre puts the cost of proposed links at US $2.3 billion over the next four to five years. But the region will save US $4 billion annually once the links are established. Outstanding article on Energy in South Asia. More than Electricity generation, energy conservation and saving yields immediate results. Enormous wastage occurs in Electric pump sets for irrigation because of old and aged pump sets. In many states power tariff for motors is low and in some states it is free. A scheme can be chalked out where a subsidy of Rs 15,000(out of total cost of about Rs 20,000) per motor for 5 HP can be provided to replace the old ones. Electricity is a high grade energy which finds use in lighting,industry,computers etc. Each Kwh is saved is each Kwh generated. National Productivity Council (NPC), an autonomous organization under the Ministry of Commerce, Government of India, was asked by BEE to undertake the study of energy saving potential in all 35 states / UTs. The study focused only on estimation of the total electricity consumption and saving potential in different sectors of each state / UT. The potential for savings is about 15% of the electricity consumption. The BEE study pertaining to SME revealed the overall saving potential of the clusters is about 72,432 TOE (Tonnes of oil equivalents) which is 27.4 per cent of the total energy consumption in SMEs. The Maharastra Electricity Regulatory Commission has provided for a Charge as well as a Rebate, consumers were incentivised to reduce demand through better planning and utilization of electricity, rather than by fiat. Since then the MSEDCL has a provision of LMC (Load Management Charges) in its tariff. It has been observed that rural areas has a tremendous scope in load management as the pump sets used for irrigation purpose are highly inefficient and since the tariff applicable for them is flat rate tariff the farmers have least interest in efficiency of the equipments hence there is a need of Agriculture DSM. In order to accelerate energy efficiency measures in agriculture sector, BEE has initiated an Agriculture Demand Side Management (Ag DSM) programme in which pump set efficiency upgradation would be carried out through Public Private Partnership (PPP) mode. The objective of the program is to create appropriate framework for market based interventions in agricultural pumping sector by facilitating conducive policy environment to promote Public Private Partnership (PPP) to implement the projects. When about Rs 5 lakhs for solar pump is provided as subsidy(out of about Rs 6 lakhs), why not small subsidy for electric pump sets, whose saved electricity can be used in other cases. In the case of solar pumps, in dry fields(open canals) the water will be evaporated and for wet fields the quantum of water pumped may not be sufficient. Solar pumps need storage tank also. Solar pumps work for small applications only. Put the RENEWABLES to WORK: To get inexhaustible,pollution-free energy which cannot be misused.